Specifications are an important element in Six Sigma approaches. Before the 1800s, all products were manufactured one at a time by craftsmen. A gunsmith, for example, would shape a single barrel of a gun and then expertly carve a single wooden stock to match the barrel’s dimensions. The pieces fit together because the craftsman adjusted each part to match the other. A revolution was ignited when specialists began to separately create each of the components of a product. Because the specialists each focused on a smaller area, they became more expert and efficient in producing that piece. It was in this environment of economic revolution that specifications were born. Getting Billy Bob’s barrels to fit into Cletus’s wooden stocks required some formal coordination. Specifications told the specialists what size or shape to make their parts. That way, when all the separate parts were assembled together, they would still fit. A specification is the value separating acceptable from unacceptable performance. You probably consider spending more than $200 a month on movie tickets unacceptable for your personal budget. But what about $100? $50? At what dollar value is movie ticket spending acceptable or unacceptable? That’s your specification. This definition holds for all process or characteristic performance measures. Specification limit (SL): Any value designating acceptable from unacceptable performance. One-sided specification: A specification limit that designates only a single transition point from acceptable to unacceptable performance. For example, if you care only that the characteristic or process performance not exceed a certain upper value, that is a one-sided specification. Two-sided specification: A pair of specification limits creating an interval of acceptable performance between the two limits. Upper specification limit (USL): A value designating an upper limit above which the process or characteristic performance is unacceptable. Lower specification limit (LSL): A value designating a lower limit below which the process or characteristic performance is unacceptable. If set up correctly, specifications represent the range of values at which a characteristic is still acceptable to the customer. Often, customers aren’t directly involved in your work; you never directly interact with them or see them. But a characteristic’s specification is always available to you! In this way, specifications are said to represent the voice of the customer (VOC, for short). You should never create specifications arbitrarily. Unless they actually represent the values that separate good from bad performance, specifications become a stumbling block to progress. If you set a specification too loosely, your customer will be dissatisfied or upset with the performance of what you provide, even though it meets the specification. If a specification is set too tightly, you spend more resources than you should. Imagine a specification requiring a delivered pizza to be between 120.4 degrees Fahrenheit and 120.6 degrees Fahrenheit when it arrives at the customer’s door. To be within this required temperature range, the pizza company would have to take some pretty complicated and expensive actions. Maybe they’d have to use space-age ceramic pizza boxes made out of space shuttle tiles. Meeting that specification would take a lot of work and expense. But do customers really require this extent of control over the temperature of their pizzas? Probably not. A less troublesome specification, and one just as satisfactory to the customer, may be 115 degrees Fahrenheit to 125 degrees Fahrenheit. Reasonable: Is the specification based on a realistic assessment of the customer’s actual needs? Does the specification relate directly to the performance of the characteristic? Understandable: Is the specification clearly stated and defined so that no one can misinterpret it? 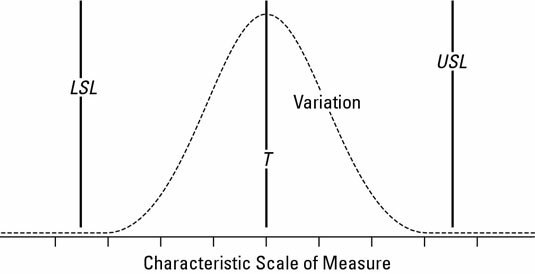 Measurable: Can you measure the characteristic’s performance against the specification? If not, a lot of debate will ensue between you and your customer as to whether the specification has been met. Believable: Have you bought into the specification setting? Can you and your coworker peers strive to meet the specification? Attainable or achievable: Can the level and range of the specification be reached? You need to review each specification to make sure that it passes the RUMBA test. If it falls short in any of the RUMBA categories, begin to develop a plan to bring the rogue specification back into control. Very often, an improvement project is fast-tracked or solved through a simple RUMBA review and adjustment of the involved specifications; the performance of the characteristic or process never has to be changed! Always review the appropriateness of specifications early in your Six Sigma project.